O.K., not all cats are that bad. Bruce seems pretty cool. But the cats that live here…dumb. 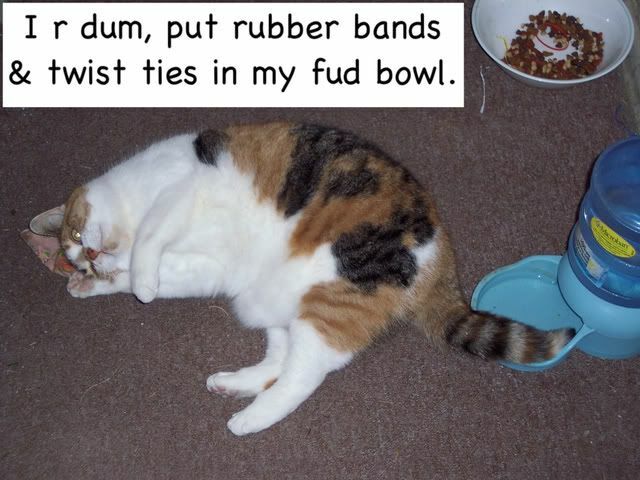 Here is Chloe playing, being fat & being dumb & not knowing her tail was in her water dish. I LOL’d her for my your amusement. I didn’t want Moe to feel left out, so I LOL’d her too. 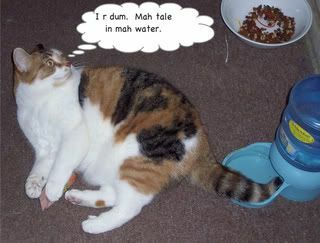 By the way shouldn’t someone start a literacy fund for those Lolcats & Loldogs. Their spelling and grammer are awful. My mom person laughs at the Lol’s. I find them insulting on Loldogs. On Lolcats, I think it’s probably pretty accurate. Oskar, I have a confession to make. I’ve read a lot of amusing stuff on the internet but I’ve never literally busted out laughing until now. 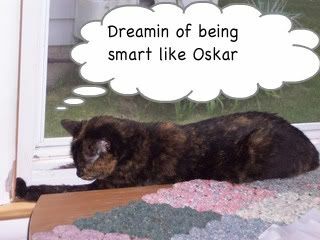 Oskar, you are a hoot, love this post, thanks for the chuckles. Oskar.I’ve got a few pennies for that Lol fund. Those cats of yours could certainly use it. Disgraceful you know they don’t even know how to spell Oscar…err Osker..Oska. I’m gonna add to you to my pals. Hi Oskar – your excessive handsomeness mixed with your beguilding charm and intelligence obviously has Blogger quaking in their boots. They’re no doubt threatened by such a combination and have decided to stop your profile and picture being published as a result. If we weren’t in such awe of your ‘way of the schnauzer’ we might well feel the same way ourselves, but we are humbled by your wisdom of the World and read your blogs with total devotion, only hoping that one day we can be achieve even a fraction of the wisdom that you have gained. We hope Blogger sees the error of their ways and reverts your profile back to it’s rightly published place! With endless admiration and affection – JD and Max. Hee hee! LoL! I’d be glad to pitch into the fund. I wonder if they is such a thing as an Oskat@!! LOL as always Oskar and Mimi.